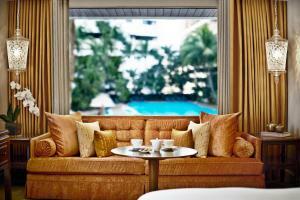 A minute’s walk from Ratchadamri Skytrain Station, Anantara Siam Bangkok Hotel is a touch of Thai luxury in the city. The hotel features a spa, an outdoor pool and free parking. 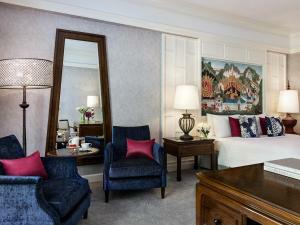 Rooms feature elegant touches of Thai culture, offering décor made of teak and Thai silk. A flat-screen TV and DVD player are provided. 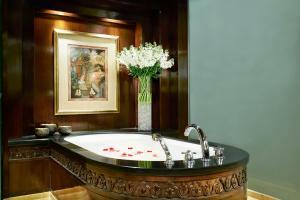 Grand, en suite bathrooms showcase elegantly carved wood furnishings. Guests enjoy free use of a smartphone with free international calls and internet. 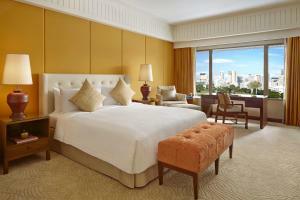 Anantara Siam Bangkok Hotel is a 10-minute walk from Central World Plaza and Lumpini Park. Bumrungrad International Hospital is a 12-minute drive away, while Suvarnabhumi International Airport is 25 km away. 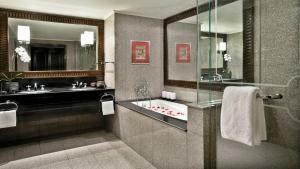 The Spa by MSpa provides the option of a spa suite with a private plunge pool and complimentary herbal tea and cookies. 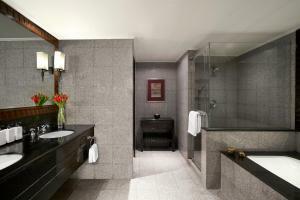 Guests can head for the health club which has a steam room and offers fitness classes. 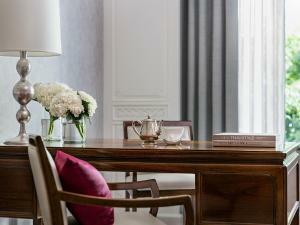 Younger guests can look forward to treats such as bedtime milk and cookies and a range of children’s toiletries. 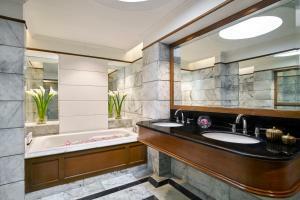 The hotel provides 9 restaurants and lounges including Italian cuisine and Japanese creations. Local Thai delights are featured at Spice Market while Mocha and Muffins serves a selection of cold cuts, sandwiches and fine wines. Aqua Lounge and The Terrace offer casual dining options. Guests enjoy use of a complimentary in-room handy smartphone with the following features: - Free unlimited local calls - Free unlimited international calls to 10 destinations (Australia, China, Great Britain, Hong Kong, India, Japan, Singapore, South Korea, the United Arab Emirates and the United States) - Free unlimited 4G data connectivity with WiFi tethering capability to other mobile devices, such as laptops and tablets - Digital city guide with recommendations and promotions for restaurants, shops and attractions. Please be informed that for children under 12 years staying free of charge with existing beds, breakfast is not included. 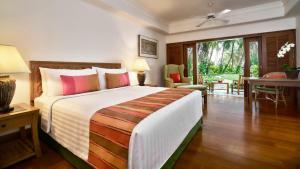 Spacious room situated on 2nd-8th floors, offering views of the nearby residential areas. Guests enjoy use of a complimentary in-room handy smartphone with the following features: - Free unlimited local calls - Free unlimited international calls to 10 destinations - Free unlimited 4G data connectivity with WiFi tethering capability to other mobile devices, such as laptops and tablets - Digital city guide with recommendations and promotions for restaurants, shops and attractions. 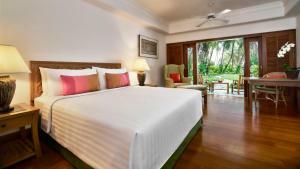 Rate: THB 6082.73 ... THB 38134.80; select dates below to get current rates. 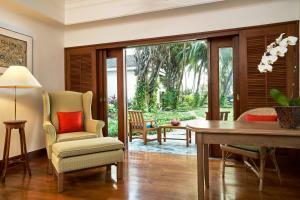 Located near the outdoor pool, this spacious room offers a private patio which overlooks the pool and lotus pond. Guests enjoy use of a complimentary in-room handy smartphone with the following features: - Free unlimited local calls - Free unlimited international calls to 10 destinations - Free unlimited 4G data connectivity with WiFi tethering capability to other mobile devices, such as laptops and tablets - Digital city guide with recommendations and promotions for restaurants, shops and attractions. Offering a lighter décor, this room features views of the neighbourhood and a marble bathroom with a bathtub. Guests enjoy use of a complimentary in-room handy smartphone with the following features: - Free unlimited local calls - Free unlimited international calls to 10 destinations - Free unlimited 4G data connectivity with WiFi tethering capability to other mobile devices, such as laptops and tablets - Digital city guide with recommendations and promotions for restaurants, shops and attractions.